September | 2009 | Star Car Central - Famous Movie & TV car news! Cruising for a Cure 2009 Nate Truman & Charger Steve Movie and TV star car pals unite! Another great gathering of star cars from movie and TV were on display for the 2009 crusing for a cure car show last weekend. To support Prostate Cancer research, and to get lots of guys tested (including a few from our group this time!) 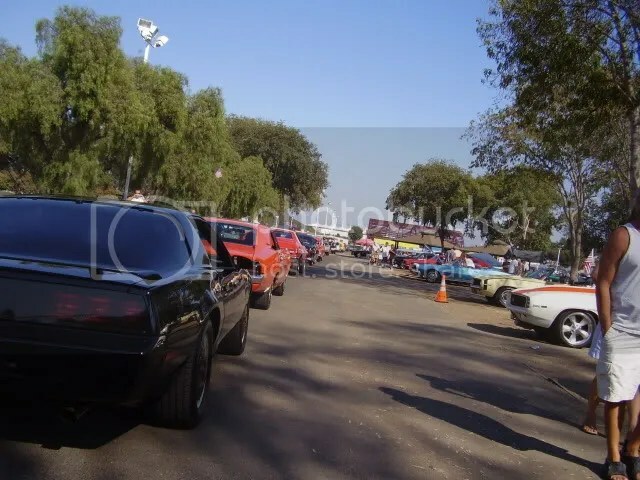 we all got in our star cars and drove to the Orange County fairgrounds for the USA’s largest one day car show event. 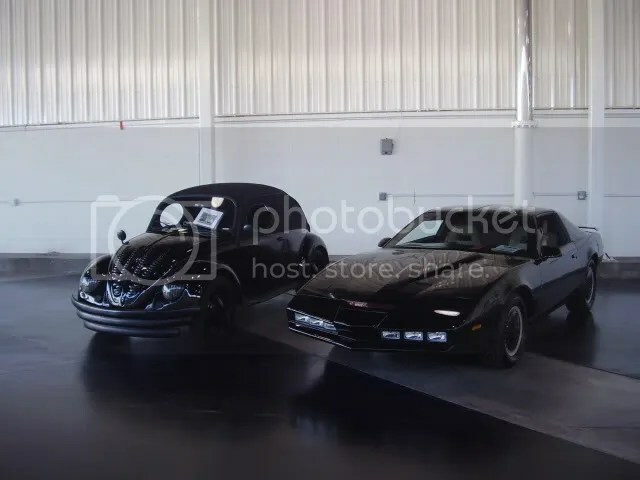 and then a nice pile of the Hollywood Star cars fron StarCarCentral.com! Alex was kind enough to go the extra miles and drop “hoff” his KITT right next to Brian’s Horace the Hate bug! Back in Black, BABY! We all kept an eye on Jennifer who was well behaved with the remote controls, and polished KITT properly all day! See Alex? That’s me videotaping her from the other side, so you can review her polishing style later and give her a report on how she did! 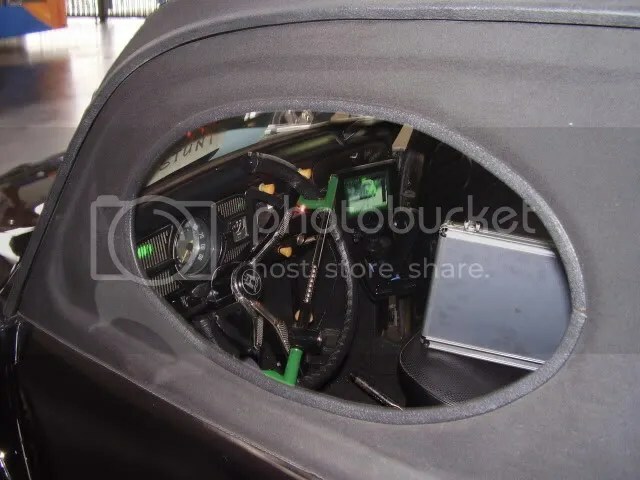 Brian upped his display with a new dvd loop of Horace in the movie, and a cool targeting scanner and pistol grip for shooting a certain white VW! Jerry brought his Herbie for a nice set of “marshmellows” one fresh, one burnt! Lou and Lynda got V.I.P. parking in a solo spot across from the rest of us…. 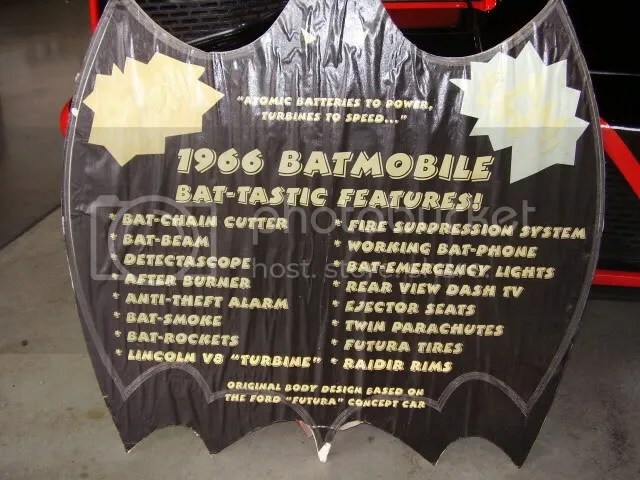 and rounding out the star cars is the NOT a Barris Batmobile – world famous Fireball Run afterburning Natemobile! I resurected the sign from the world con, (after finding it behind some stuff in my garage….) OK so I guess I could work on my display…. As usual, lots of people and fans were happy to see their favorite cars! As it was a LOT COOLER this year, we actually did take a lap, but without Jennifer’s puppydog urging, we might not have! We finally got in our cars, fired them up and took off!!! !… at zero to 2 miles an hour! To keep up the tradition, we drove past Barris’ booth again, and he wasn’t there, but we got a fun shout out from the Barris workers and Joji! Jerry and his pal and Brian talked Herbies, then Brian smiled ear to ear when he got to trigger KITT for a while, until Alex’s internal sensors picked up that Jennifer and Brian were playing with the remotes too much, and an Automated text was sent to get them in line! BULLIT owner Dave Kunz parked with us for a spell, but he’s got too many car shows to cover as a reporter, so he popped in and it was great hearing his stories and then he was off to the next event! As long as we get these parking spots, I think there will be some cool star cars at Crusin for a cure 2010 and beyond! South Pasadena Police Expo where the Blue Brothers and Mayberry Join Batman! Thanks to Officer Richard Lee of the So. Pasadena Police, the StarCarCentral.com gang showed up in force for the South Pasadena police and fire open house and car show Sunday Sept 20th! It’s a different line up at evert star car show, and this one was no different! 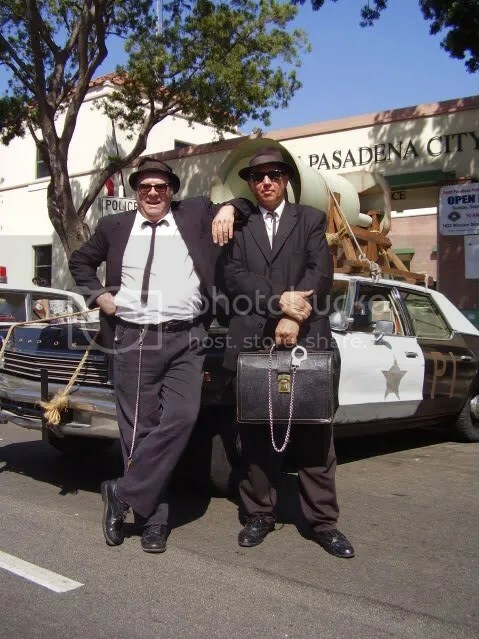 As Officer Lee has shown us great hospitality in years past, the guys were eager to shine up their famous movie and TV cars to sponsor this event. No it’s not a decepticon transformer (that got sold to some collector in Texas) just the new cool police cars that opened the event! PULL OVER!! 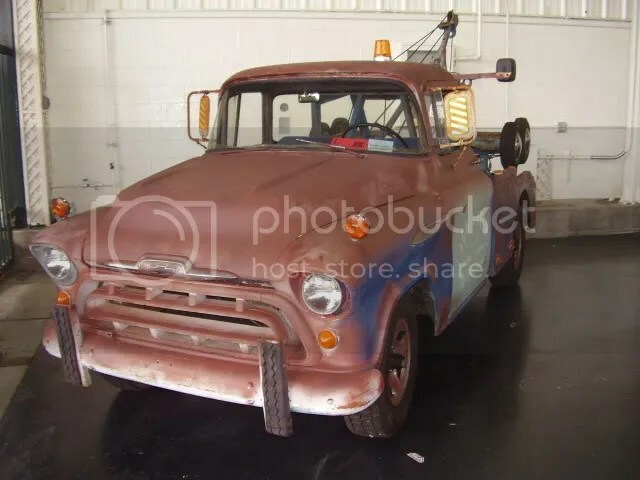 Not quite as intimidating, but I want one of these for the back lot! They look like a lot of fun, and a step in the right direction for those personal hovercrafts I was promised in Popular Science like they had on Johnny Quest! From left to right, here’s who was there! These two just have to be parked together! Lou and Lynda with her lemon squares (and the stripped tomato, from Starsky and Hutch!) were first in line, and next we were so happy to have Dave with his General show up with his family and support the police and fire dept. His car was cleaner than I ever saw the dukes car on TV! 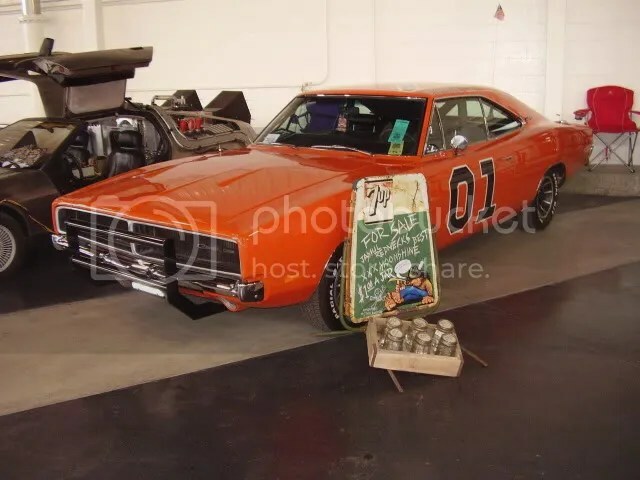 Charger Steve and Dave got to swap General Lee trivia…. I mean important details on their cars! Sue brought her Get Smart Sunbeam. Her “Max” didn’t seem to mind the sun, and posed for photos all day in a three piece suit! Brian brought his Bond car complete with a new poster featuring his car! 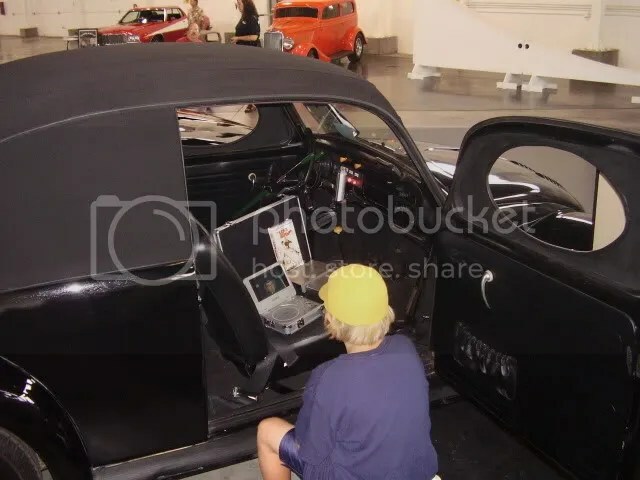 He got to talk obscure star car with a few of our fans, including one who is working on the CHiP’s Gold Firebird (Paunch’s car) and he may find a Simon and Simon Power Wagon…. 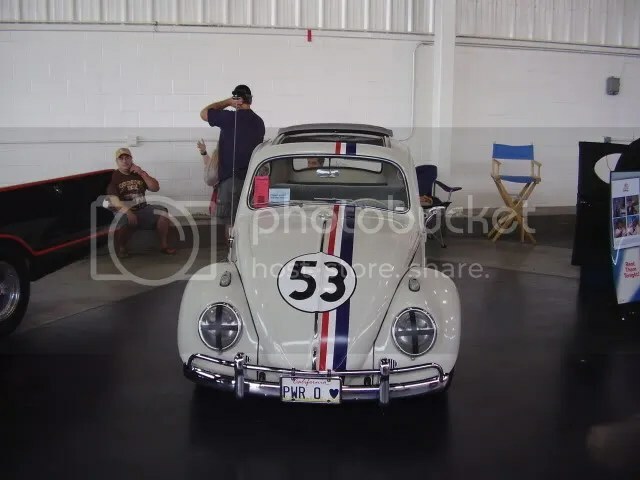 Jerry’s Herbie is always well loved and photographed, and this was no exception. He had some sort of double cheeseburger creation that looked amazing for lunch, thanks again to the SPPD for feeding all of us so well! 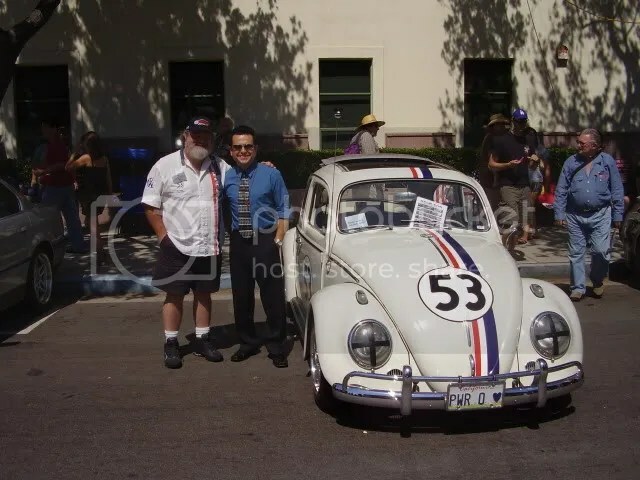 Jerry had a special visitor, the star of Herbie goes to Monte Carlo Joaquin Garay III showed up and posed for a photo! Next was Paul’s Back to the Future Delorian, and thanks to the electrical hook up, the center section of our display of famous movie and TV cars came alive! Paul put on a great show with lights, sounds and smoke, but this time he had competition! Oscar plugged in his cd player, and had the theme to Magnum P.I. coming from under his Ferrari! Next to him Alex and his pristine Knight Rider KITT was chatting with the crowd. “Where are your pants?” is still fun to hear KITT say randomly to someone! Alex decided to take the day off from working on Knight Rider stuff and spend the day with us! 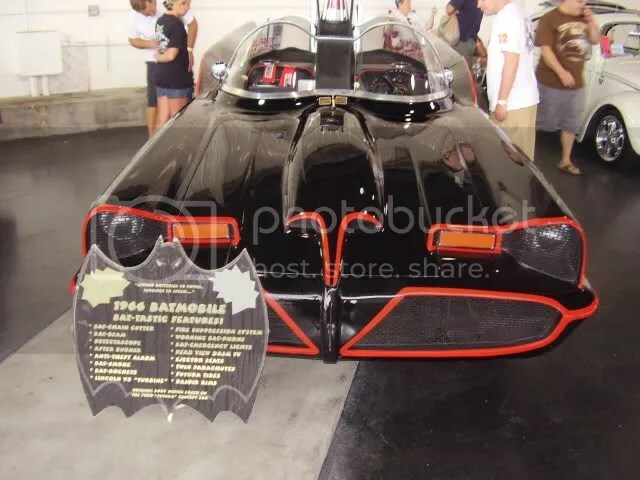 Continuing the crime fighter line up, the batmobile quietly refrained from showing off, and let Batman, Wonder Woman, Batgirl and Robin do all the showboating for the happy photographers and fans! Only at StarCarCentral.com events can you get this photograph! Nate Truman having a chat with batgirl, wonderwoman, Jason “Buckaroo” Red ranger, with a few unusual cars in the foreground! A special treat just for the police theme was Brandy’s Mayberry RFD patrol car, and it was great to spend some time with Charger Steve! It’s been a while, as he heads up the San Diego Chapter of Star Car Central, heck, he practically IS the whole chapter with all his cars! The excitement is growing for his Del Mar show in just a few weeks! Click the link to sign up your car, spaces are limited, and Charger Steve always puts on a great party! Finishing off our line up in the prime spot infront of the police HQ was Vic and Dana, and their great Blues Brother’s police car! (Cool) Hats off to them, for staying in the sun with black Suits and ties on all day, working the crowd! Note to self: Once you give Dana a Microphone, don’t expect to get it back any time soon! He’s a crack up, and he’s got a million one liners! Not sure how they did on tips, but I know they got fed well! Jason stopped by with his Herbie to take some photos and head out, and in his travels he found this “sort of” A-Team van, hey at this point, I will consider it…..
Of course Jason always on the lookout for a photo op, convinced all the super heroes to mosey over to HIS car for a quick shot! Thanks to Scott and Vicky and their two “wards” batgirl and Robin for taking their day to amaze little kids and pose for lots of photos in the hot sun! I don’t know how they do it! Also special award for being a trooper to Batgirl, who “played injured” with a hurt toe! So starts the busy season for StarCarCentral.com! Next week the biggest one day car show on the west coast, Crusin for a Cure at the orange county fair grounds, so stop by and say “HI!” we will be under shade between two of the front buildings! 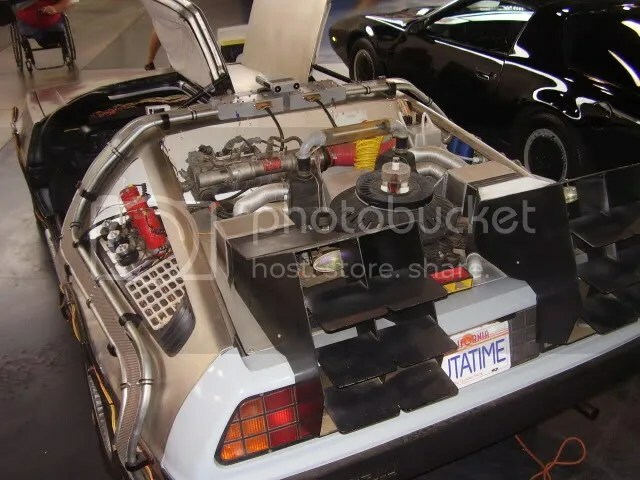 Charger Steve is bringing his BTTF Delorian (first movie style) to debut at the cruise this coming Saturday, Sept 26th 2009 but all of our other delorian pals will be gull winging their way to Vegas for a big Back to the Future convention! Our own Paul Nigh will be showing his personal original props from the movie! STARCAR CENTRAL APPEARANCES FOR THE REST OF 2009! so come on by and say “HI” to the star car central members! SEPT 26th cruising for a cure ORANGE COUNTY FAIR GROUNDS BIGGEST ONE DAY CAR SHOW!! from 10 a.m. to 3 p.m. Admission is free for the entire family. Along with viewing hundreds of hot rods, muscle cars, antique and classic cars, this event will also include music, food, shopping booths, games and bounce house for kids, and more! Marines from Camp Pendleton will be in attendance, as proceeds from the event go to benefit the Marines and those who minister to them. For information, contact Richard Smith at teli1@verizon.net. WHERE: Parade begins at LAFD Fire Museum , 1355 N. Cahuenga Blvd. Del Mar Fairgrounds on Sat Oct 10th. Daisy Duke WILL be there as our special guest along with a Monster Truck, Bikini Contest, Burlesque Show, Drag car and hundreds of cool classics and WILD hot rods… Oh Yeah AND MOVIE CARS!